(E) means "still experimental here"
(S) means "surefire success," easy to grow. We graft semi-dwarf ( EMLA 106) trees that will mature at 12-16' but can be kept smaller. 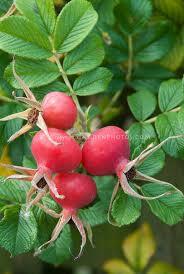 All varieties listed are resistant to fireblight, cedar apple rust, and mildew. Order at least two different varieties for cross-pollination. 2-4' $14 each. 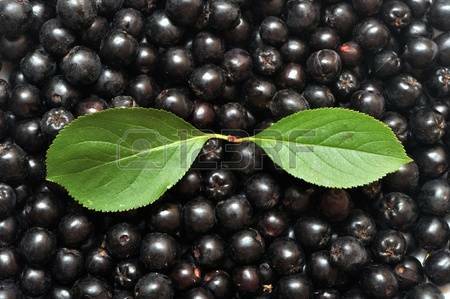 "Black Limbertwig" - A local variety with creamy flesh, good flavor, and dark red skin. Late blooming. "Horse" - An old Southern favorite with green skin and a tart flavor. Early ripening. Excellent baking apple. "Hubbardston Nonesuch" - Greenish yellow skin with a crisp, sweet flavor. Mid season bloom and late ripening. "Liberty" - Macintosh-like flavor with mid season ripening. Resits scab. Needs thinning for larger apples. "Paducah" - Mid-season ripening with a dark red color striped over green. (see picture above) Flavor has been compared to Winesap. Good fresh and cooked. "Susie"- A sweet, juicy apple with yellow skin. Local seedling with dependable crops. Mid-season ripening. Do you have an old apple tree that you'd like to save or does a friend have a tree that you'd like to have? We can custom graft from your scion. Cost is $16.00 per tree, prepaid. We'll send you detailed instructions on how to collect the scion wood. 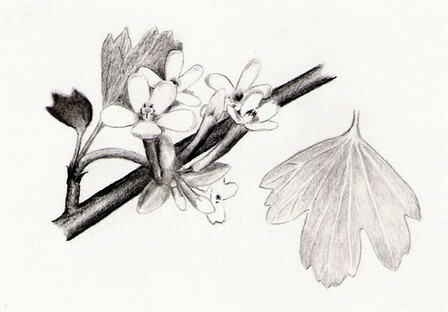 These ornamental, native shrubs have white flowers, black berries, and red autumn foliage. While some eat the berries fresh, we prefer them as jelly or juice. Zones 3-9. 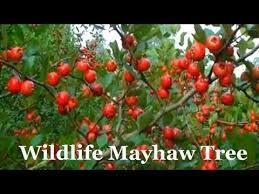 A small European hawthorn (to 10') with tasty orange fruit and glossy reddish-green foliage. Blooms profusely in late spring with fall ripening. Berry-sized fruit that makes a jelly similar to apple jelly. Self-fertile. Zones 5-8. "Chester Thornless"(N) - Sweeter than other thornless varieties. Beautiful against a wall or on a trellis. 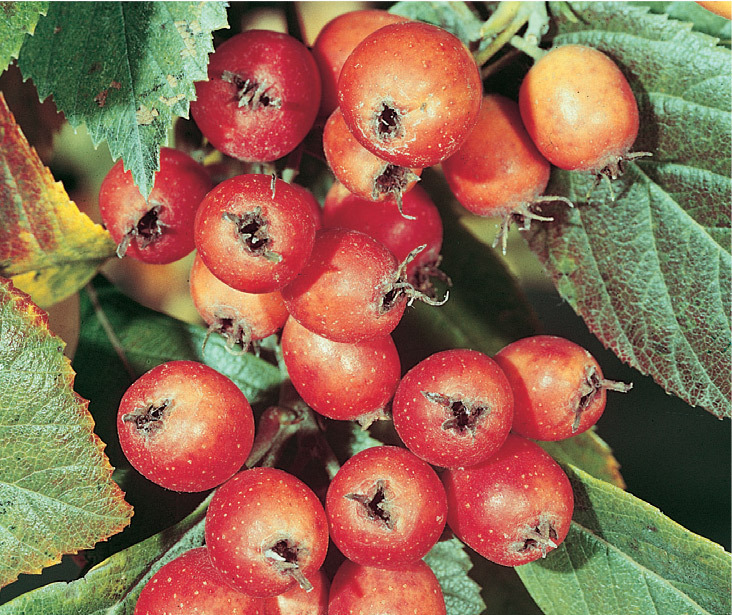 Large, sweet, firm berries and productive for 6 weeks. We've grown rabbiteye blueberries for over 25 years as a cash crop. In Spring, they have pretty bell-shaped flowers and,in Fall, the foliage is a striking red. Blueberries make good hedges and container plants. They need plenty of water and acid soil, so treat them as you would a rhododendron or azalea. They grow 6-8 ft. Order both varieties for cross-pollination. Zone 6-9. "Tifblue"(N) - Still the standard among rabbiteye blueberries. Tifblue starts bearing in July here and still has some berries in September. Medium to large berries with excellent flavor. "Climax"(N) - Early ripening and sweet. Uniform ripening over a 2-3 week period makes the harvest easier. An early blooming, very attractive shrub to 8 ft. with pink blossoms, light green foliage, and tasty cherry-like fruit. Birds and children really love these spring fruits. For heavier bearing, order two or more. Zones 3-6. Cannot ship to CA. Drought tolerant but requires a well-drained soil. These trees do well with our late frosts and are virtually maintenance free once established. 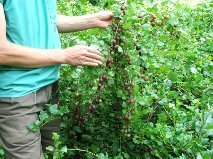 Grows to about 12' and produces slightly sweet cherries that can be eaten fresh or in pies. Self-fertile. Zones 4-8. Cannot ship to CA. 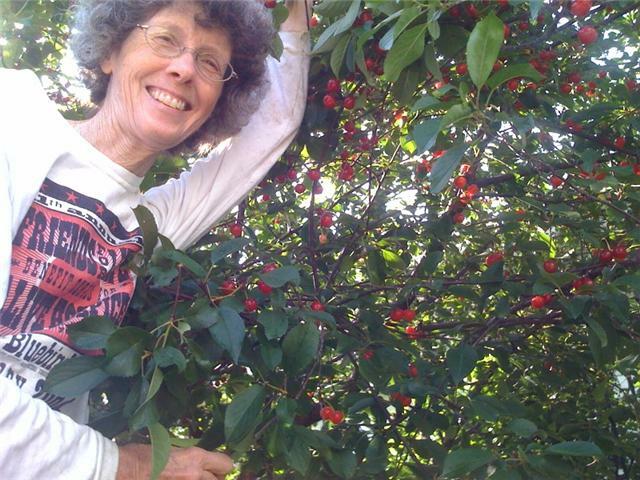 "CKVL #1"- This beautiful tree had so many cherries that we asked gardener Sara DeBovis if we might propagate it. Can't name the variety but we can vouch for its productivity. Trifoliate orange - The only member of the citrus family that will grow outdoors this far north. Unlike other citrus, it loses its leaves, leaving its green and twisty branches to grace the landscape in winter. The fruit is sour and seedy but can be used like a lemon. Interesting twisted, dwarfing habit with thorns. Makes a great living fence. Grows to 7' Zones 6-9. Can not ship to CA, FL, or TX. Bodacious - Our own selection. Large quantities of medium sized fruit. Resistant to leaf spot. Chicago- Another disease resistant variety with large fruit. Earliest ripening. This shrub (8-12') is very ornamental with its panicles of white, hydrangea like flowers in late spring and clusters of bright red berries in fall. 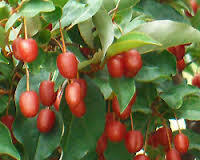 The fruit, which has one seed, can be used as a cranberry substitute and is tasty dried. Popular with birds and tolerates some shade. Zones 3-7. 1 yr plants $12.00 each. Phillips" - A Meader selection. The flowers of Crandall black currant bushes are golden yellow, have a long tubular form usually tipped with red, and emit a spicy clove fragrance. Red currant flowers are not showy but the red "strigs" of fruit are quite beautiful. In the South, plant in partial shade. Zones 3-7. 1-3' $12.00 each. Cannot ship to DE, MA, ME, NC, NH, NJ. "Crandall" (N)- R. Odoratum. Exceptional size and quality of fruit with a mild flavor. Resistant to most diseases and withstands hot dry summers. "Ben Lomand"(N)- R. Nigrum. Large excellent fruit. Will cross-pollinate Crandall and increase yields. These lush plants can be grown in pots in the North and brought into a protected area for the Winter. They can also be planted outside, but should be protected from very low temps with hay or leaves. We grow ours as multi-trunked bushes and usually prune back to about 4' and cover them after the first light frost and before the real cold hits. It takes about two hours to cover five bushes, but the fresh figs are worth it. Zones 6 (with protection) to 10. "LSU Gold" - large, very sweet, golden green fruit. "Celeste" (also called TN Mountain) - medium to small fruit with a tasty rose pulp. Very cold hardy. "Chicago Hardy" - Medium to small fruit with good flavor. Reputed to have been grown in Chicago originally. "Magnolia" - Medium to Large sized, bronze skinned, and sweet flesh. Most distinctive leaf of the bunch. Best suited for drier areas but does fine here. $12 each. Cannot ship to DE, MA, ME, NC, NH, NJ. "Captivator" - Almost spineless with pink skin and slightly sweeter fruit. "Sabine" - Purple, large and flavorful. Few thorns. This "cherry elaeagnus" is similar to autumn olive in flavor. 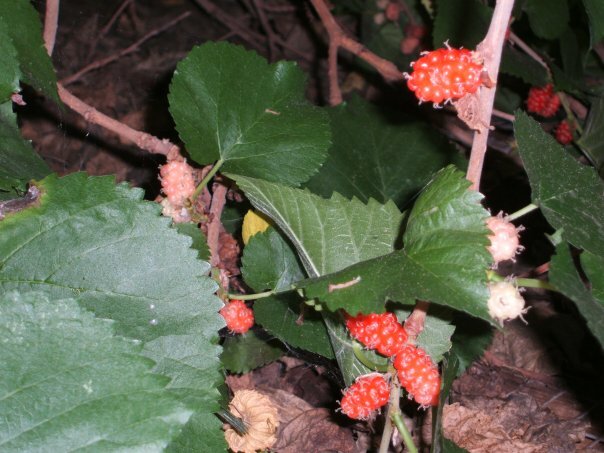 The delicious berries are larger and ripen in early summer. They are also good dried when the one seed becomes unnoticeable. This plant is shrubbier than autumn olive and has never been accused of invasiveness. Nitrogen fixer. Zones 5-9. 2 year plants, $16.00 each. Relatively trouble free, these plants can take our late frosts. Though it looks a bit like a blueberry, the fruit makes a finer pie as baking brings out the almond flavor of the seeds. Good fresh eating and the birds love them. Zones 4-8. "Regent" - A. alnifolia. Shrub grows to 4-6'. This hardy kiwi is a vigorous vine without any pest or disease problems. 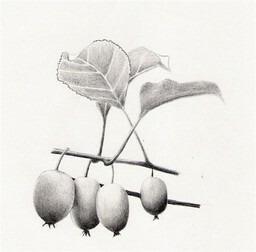 Compared to the New Zealand kiwi usually found in the supermarket, this fruit is smaller (like a large grape), sweeter (with a lime-pineapple flavor), and has no fuzz. Our main producer is over 30 years old and yields about 250 pounds of fruit. Young vines need to be protected from frost for the first year or two. Special care instructions included with your order. Zones 5-9. "Ananasnaya" (female) - Developed in Russia, this is the best flavored and largest fruited available. Ripening in May, the lacquer-red fruits can be eaten fresh but are best when made into the unusually delicious jam famous in the south. Also used in pies, syrups, butters, and wines. 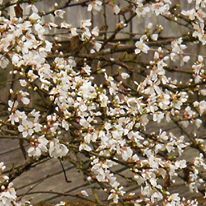 Requiring little care, these native, long-lived trees are small (to 12'), densely branched, and have delicate white flowers tinged with a pink blush. Self-fertile but does better with another variety. Zones 6-9. The following were selected by T.O. Warren in Mississippi and have done the best for us here. From Central China, these attractive trees have grown to 15' and stayed relatively compact for us. 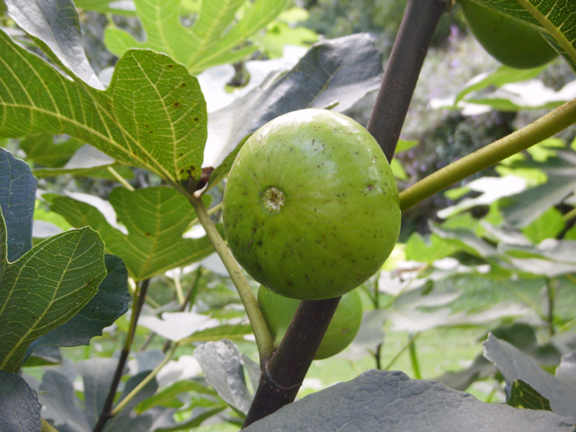 Also known as Che or Chinese mulberry, this tree is a member of the Moraceae family which includes figs and mulberries. Fall ripening fruits are bright, rose-pink when ripe, about the size of a cherry, and taste like watermelon mixed with fig. Pest free. Zone range seems to be 6-9 though we do know people in 5 growing them. Male and female trees available. Order both to insure pollination. If space is a problem, the CA Rare Fruit Growers website suggests planting them about a foot apart and growing them as one tree - pruning them to 25% male and 75% female. After a long winter, these beautiful trees present us with the first fruits of the season. They taste a bit like blackberries without the large seeds or thorns. People are often surprised at how good they taste and birds will choose them over other fruits. The trees can grow to 30' and need 15' of spread on each side. For those with less space, summer pruning can keep them to about 10'. Self-fertile, grows fast, and fruits early. Zones 5-8 (possibly 9). 2-4' $20.00 each. "Illinois Everbearing" - Large fruits, over 1" long, with pleasant mixture of sweet and sour flavors. Heavy bearer. "Noire of Spain" - black fruited variety good for warmer climates. Zones 7-10. 1' plants 12.00 each. "Wellington" - Considered the best by the Geneva, NY testing center. Good sized fruit with a more upright habit. 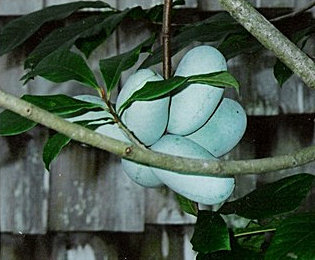 We have many years of experience growing pawpaws. Pawpaws have a reputation for transplanting difficulty but we have found that timing, root quality and fertile, well-drained soil make all the difference. Our pawpaws are grown in pots to keep their taproots intact and we are successfully shipping them bareroot. Our special care instructions are included with your order. Order two different varieties for pollination (unless self-fertile). Zones 5-9. We offer a large selection of varieties that have been chosen for superior fruit. Please list substitutes as there are limited numbers of each variety. We will always substitute slightly smaller plants unless otherwise instructed. "KSU Benson™ - Round, early ripening medium size fruit with high yield. 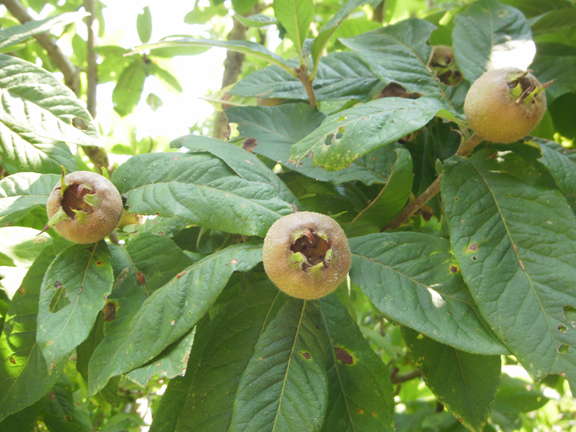 "KSU Atwood™ - Medium sized fruit with yellow orange flesh and few seeds. "Lehman's Chiffon"- Jerry Lehman's cross of Prolific X Sunflower. Produces large crops of creamy fruit with a sweet aftertaste. "Mitchell" - Cream colored flesh. Large oval to round fruit of excellent flavor with an airy texture. From IL. "NC-1" - From Ontario, with large early ripening fruit, few seeds and great flavor. "PA Golden"(#3) - Oval-shaped, yellow fleshed selection from John Gordon of NY. Matures mid-Sept. in NY. "Prolific" - Corwin Davis selection. Yellow fleshed , thick texture, mild flavor, small seeds. "Overleese" - From IN. A reliable annual bearer of large fruit. Excellent flavor and few seeds. "Sunflower" - Large fruit with excellent flavor. Self-fertile. "Taytwo" - Reliable bearer of medium fruit of good flavor. "Wells" - From IN, orange-fleshed large fruits. All pears that we offer are fireblight- resistant varieties and tested in our fireblight prone orchard. Asian pears bloom earlier and will need each other, or possibly Turnbull, to cross-pollinate. Zones 5-8 (and 6-9 for Asians) . 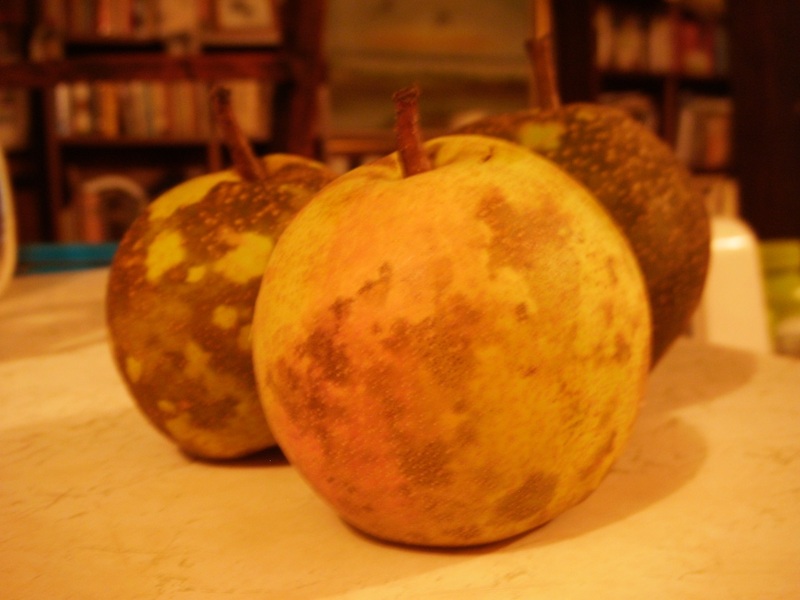 "Olton Broussard" - An Asian type pear that can still ripen after picking, and stores well. It tastes more like a European pear than other Asians, with a delicious, sweet flavor. "Turnbull" - Large fruit with a crisp, juicy apple-like flavor. Long bloom period. "Korean Giant" - Asian pear. Heavy producer of large late ripening green fruit. "Shinko" - Asian pear. Tasty and productive. Needs thinning. We can custom graft from your scion for $16 a tree. Grafted trees of selected, improved native persimmon. Fruits taste a bit like apricot mixed with cinnamon. A beautiful tree growing to 30' with mottled bark and attractive, shiny foliage. Spectacular in fruit. Zones 5-8. 1-2' $20.00 each. Cannot ship to CA. "Pipher" - IL selection with good size, production, flavor, and ratio of seed to pulp. 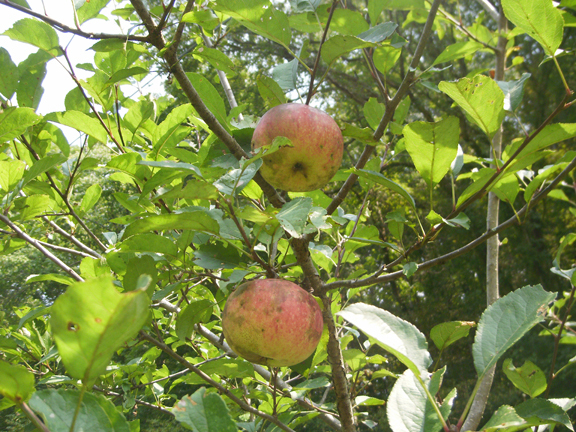 "Tatum" - From KY, this Early-golden type is loaded with fruit. Good flavor and texture. 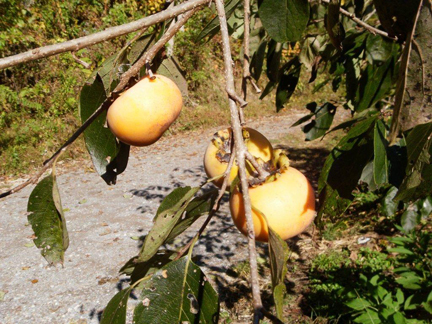 "Yates"(also called "Juhl") - From S. Indiana, these large, flavorful fruits ripen early. "Meader" - Good fruit size and flavor. Self-fertile but produces more with a pollinator. "Native male" - If you don't have any persimmon trees in your area, you may want to order one of our grafted male pollinators. The males sell for $10.00 each. "Rosseyanka"- A Russian hybrid of American and Asian persimmon. Fruit is large, nearly seedless, and tastes like kaki persimmon. "Heritage" - Cut the canes to the ground in Winter. The new canes will bear their first crop from August to frost. The following year, if you don't cut them down, you should have a crop in June and again in fall. Zones 4-7. 5 for $24.00 or 10 for $40.00. Growing 4 to 6' with 3" single pink flowers. Good hedge plant. Zones 3-8. We apologize, but we cannot ship orders outside the United States. If you prefer to mail in your order, download an order form in PDF format for Acrobat or RTF format for Word and follow the instructions on the form. Plants will be shipped USPS Priority mail. Please let your postal carrier know when you expect your package and where to put it. Packages are compact and about 4 ft. tall, so shipping to work or a neighbor is easy. We cannot be responsible for packages that cannot be delivered. If a package is visibly damaged upon arrival, please contact USPS first as they require inspection. Adjustments may be made for very large orders. If you prefer Air shipment or live in AK or HI, please call for shipping costs. Payment accepted in cash, check, money order, or PayPal. Sorry, no COD. We cannot ship out of the country. Our shipping season runs from early November to late April. (At times this can be extended for northern customers, so check with us.) We do not ship most holiday weeks or when there is danger of plants freezing in transit. Please list substitutes or indicate a willingness to accept a back order, as we sometimes run out of different selections. Order as soon as you can to avoid disappointment, even if you want your order shipped in the spring. We will substitute at our own discretion unless your order states otherwise. When ordering through Paypal there will be a place on the invoice to leave us a note. Please list your preference for substitutions, backorder, or refund.